Yes, I shamelessly stole these from Facebook page about Run8. But none the less they are true. Trust me, they bug the crews too. I had a guy the other day who walked up to me and told me he had a problem with how we parked the train. I love when we're breaking a unit train up in our yard. Theres a grade corssing 45 car lengths past the end of our yard lead and if someone flips off my engineer or honks their horn when he has to block it, he'll call out over the radio "take as much time as you need. I'm in no hurry"
"We will probably be judged not by the monuments we build, but by those we have destroyed"
I think that engine will need a serious overhaul after the run. Perhaps there was a "Maximum overdrive" button in the cab of the locomotive somewhere? 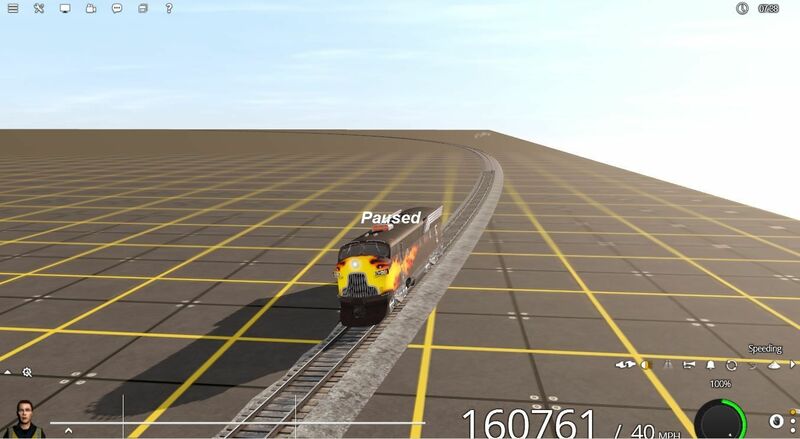 Anyways,this is why you shouldn't even think about messing with the engine spec of this locomotive. Also had to pause just to get the snip because... well,it should be obvious because of the speed. Hopefully it wasn't a huge bump anyways. Curious ... How many cars can that pull up a ridiculous 20% grade ... does it have ridiculously super powerful traction as well ? It can't pull anything (In DCC mode at least.) due to the fact that it accelerates so fast,it will derail even with derailment off when trying to pull something. But if it didn't derail when pulling something,then it could do that with ease I suspect. And in case you're wondering about . . .
For comparison, the fastest man-made object ever made, NASA's Juno Mission Spacecraft, travels at 25 miles per second, so . . . So if the hot rod F7a was a real locomotive, it would hold the record as the fastest man-made object ever made.